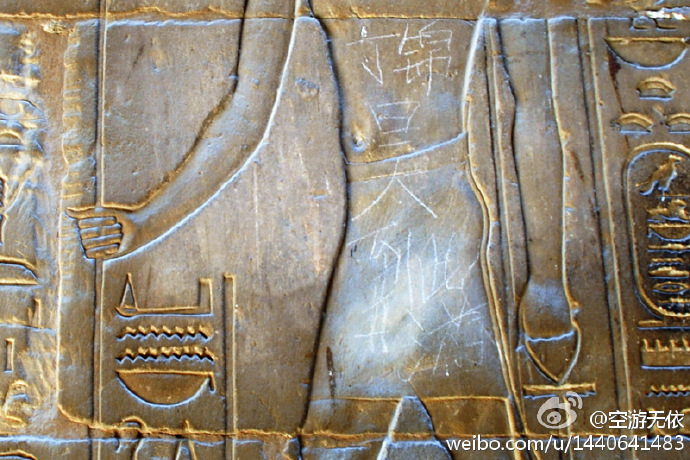 A young tourist who scrawled his name on the almost 3,500-year-old Luxor Temple in Egypt has drawn the ire not of Egypt but his home country of China. The graffiti, which translates roughly as “Ding Jinhao wuz here,” was etched onto the the Luxor’s wall engravings with a rock. A photo of the tag was taken by a different tourist and posted on China’s Twitter-like Sina Weibo microblogging site. The photo has caused outrage in China, where only last week Chinese visitors to foreign countries received an official admonition to straighten up and fly right. There is much hand-wringing in China over the image of the country abroad and the graffiti has been highlighted as an example of why China has such a poor reputation. The rapid spread of the photo has prompted what is called in China a renrou suosou – a “human flesh search,” in which Chinese Internet users attempt to expose individuals to public humiliation for online content perceived as offensive. The search has prompted other individuals named Ding Jinhao to publicly declare or prove they have never been to Egypt in order to avoid repercussions. Meanwhile, the real Ding Jinhao has reportedly been outed as a 15-year-old student in Nanjing, whose parents have apologized on his behalf, saying he was young at the time and just copying what he had seen done elsewhere. Interestingly, the photographer’s tour guide in Egypt allegedly saw no reason to blame the boy, saying it was the tour guide’s responsibility to prevent vandalism.